You know, there is one phrase I like to remind myself of when I’m in need of a little giggle, for those (frequent!) scenarios when I don’t get this mummy-thing going as smoothly as one would hope; “God loves a trier”. I tried cloth diapering, I tried with all my heart. I so wanted to make it work for our family, and it was working…….until Nixon had a very large segment of his large intestine removed and he was finally able to poop unaided! Our little man has Hirschsprungs Disease and though it’s awesome that he is now able to poop, the fact is that at 2 years and 3 months, he has never passed, and may never pass, a solid poop in his life. I’m sure you get what I’m saying here, but that, friends, marked the end of my cloth diapering journey. What was surprising to me was that once you get your system in place, using cloth nappies isn’t the ‘ordeal’ that I had envisaged. Now, to be fair, we were never 100% cloth. Nix still wore a disposable at night and if we were going to be out and about for a while. However, I was proud of that little commitment I was making to reduce what we were sending to landfill! These sentiments are shared by Snazzipants who believe that modern parenting is all about being smarter and making small changes that add up to a big difference. Using cloth nappies part time like we were with Nix can result in an impressive financial and environmental saving. Switching out 3 disposable nappies per day for Snazzipants will net a saving of $500 per year and see 1000 less nappies hit the landfill! Trust me, this is coming from a lazy-mummy-extraordinaire – my whole life is about convenience lol, three cloth nappies a day is totally doable! 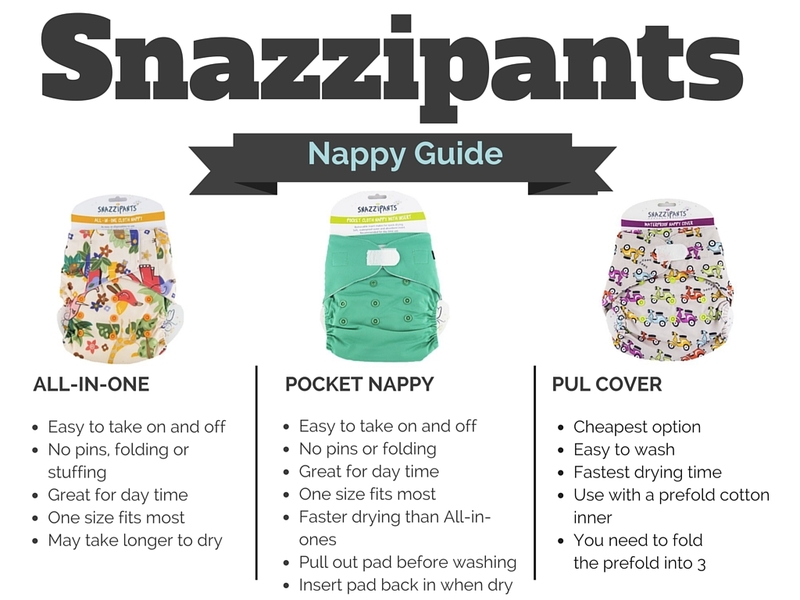 The relaunch of Snazzipants, one of New Zealand’s original cloth nappy companies, has seen them streamline their offering, and this appeals to me immensely. One of the weirdly confounding things (at least for me) when I was beginning my cloth journey, was trying to figure out what the differences were between the many styles of cloth nappies offered, when they all looked the same to me – keeping in mind I was shopping online! Just in case anyone else is confused by what in the heck an All-In-One or a PUL Cover is, the chart below should help explain things! If you’re on board with starting Disposable-free daytimes in your house, just let me know in the comments below and you could win a super-cute prize pack containing 1 all-in-one nappy, 1 pocket nappy, 1 roll of nappy liners, a Snazzipants money box (the perfect place to stash all that money you’re saving!) and a Snazzipants drawstring bag. There’s another prize pack up for grabs over on my Facebook page so head over there and follow the instructions on the contest image. Competition is open to NZ residents only and closes Friday 23/10/15 @ 10pm.